Another Homecoming has come and gone, with thousands of students, alumni and guests celebrating at and around Wilfrid Laurier University. Despite the streets being filled with people covered in purple and gold, Waterloo Regional Police Services were capable of keeping the peace. Mike Haffner, executive officer for WRPS, explained that everyone was generally well behaved with minimal problems and disturbances among party-goers. As far as tickets and criminal charges were concerned, there were fewer incidents than the previous year. Haffner said he wants everyone to understand the relationship between the students and the police. “We know everyone is wanting to have fun, and people are coming out of town to have fun. But we need to put those parameters out ahead of time, so people don’t lose control,” he said. 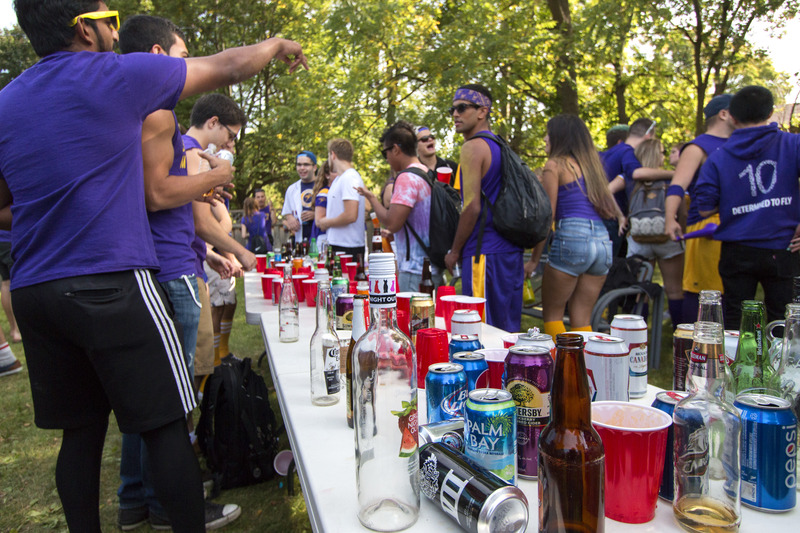 One of the biggest problems the officers faced this year was an incident of students throwing beer bottles off the 11th floor of an apartment building. Being intoxicated, students have believed this to be a harmless prank, but Haffner said police believe the opposite. “They think it’s kind of fun, but you get hit by a bottle heading down from the 11th floor and you’re probably dead,” said Haffner. Overall, there were little to no issues with parties or keggers. The WRPS were pleased with how the day went and were proud of how respectful the students were to the police. Recent Laurier graduate, Brittany Gillegean, was one of the many Laurier alumni that came back for Homecoming to show her school pride. “I couldn’t be happier to be back in the city and see old friends,” said Gillegean. However Gillegean said the street was not as hectic as Laurier’s previous Homecoming celebrations. Dana Cantarutti, a fifth-year business student, agreed. It was a differerent atmosphere but everyone agreed it was a great day. With the only downfall being Laurier’s loss to the Windsor Lancers, Olivia Matthews, president of the Wilfrid Laurier University Students’ Union, believes Homecoming was a success for both current students and alumni. “I was out there the whole day and Wilf’s and the Turret were quite busy with alumni and even current students afterwards. But all-in-all I think everyone had a good day,”she said.